(ARA) - As today's housing market has homeowners fighting the itch to move, many turn to renovation projects to improve their existing spaces. Look at a homeowner's wish list, and the bathroom often tops the list. With its frequent use and endless potential, easy changes offer a big payoff. In spite of its heavy use, bathrooms are often some of the smallest areas in a home. Cross tight square footage with limited storage, and it quickly becomes cluttered and cramped - far from a pleasant place to start and end each day. Adding function doesn't require changing your bathroom's footprint. To maximize your bathroom storage and make it work best for you, consider these design and organizational tips. A big trend in small bathroom design is the floating vanity; its wall-mount installation leaves floor space below open and uninterrupted, which tricks the human eye into reading the space as larger than it actually is. Floating vanities come in a variety of materials and designs that offer plenty of countertop space and storage solutions. Is your bathroom sporting an old bulky medicine cabinet? Replace it with a smarter option designed with innovative storage that makes life easier. 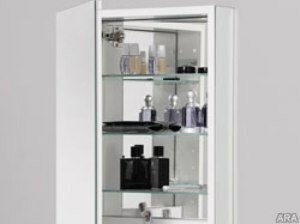 Robern, the industry leader in bathroom storage and grooming, recently introduced the R3 Series Mirrored Cabinets, a perfect solution for DIY-ers looking for a fast, affordable fix. The 1-inch flange around the cabinet's perimeter covers imperfections, eliminating the hassle of retiling or replastering, making it a project you can easily complete in a day. In a small bathroom it might be hard to imagine where you might find even an inch of extra space, but there's one secret area you can access and use to your advantage. If you have a blank wall, the space between the studs offers a plethora of potential storage space. You can build shelves directly between the studs, which adds lots of extra space for items like washcloths and toiletries, all within the existing footprint. Your morning routine charges you for the day ahead, so make sure items like electric razors and toothbrushes are fully charged, too. Cabinets equipped with outlets, such as the Robern PL Series with electric shelf, keep personal care items fully juiced and concealed, leaving countertops and sink surfaces clutter-free for a clean and organized space both you and guests to enjoy. Vanity drawers in disarray steal precious time from your morning and evening routine. First step to function: Purge. Toss old or unused cosmetics, personal supplies, grooming tools or other items you don't use. Next, reorganize with inserts that transform drawers into organizational powerhouses. Look for inserts that will streamline how you use your bathroom, such as options with different sized compartments or even one made specifically for your hair dryer.